It's pretty and twisted, and I wouldn't have it any other way. — the caged bird sings. It's pretty and twisted, and I wouldn't have it any other way. When I was in high school, I sat next to a girl in Algebra II that made me incredibly nervous. I was loud and outspoken, full of fire and opinions and a need to be accepted. My biggest fear was the "popular people", who looked better and lived better and seemed to have everything I did not. The girl I sat next to was very, very popular. Today, I know for a fact that she didn't realize how popular she was, and she probably didn't know how much she influenced my words and actions and even the way I dressed that year. We weren't close, but I admired her in a strange way, and I wished that someone like her would want to be friends with someone like me. I didn't realize it at the time, but it was already happening. Fast forward from 2006 (my Algebra II year) to 2012 (post-first-Cali move, living back in Mesquite). We'd had a little contact since school, but we didn't really talk. I added her on Facebook, and the spark appeared. We had casual chats, but eventually we realized that we were completely in sync with each other, and I started reaching out to her for everything: life advice, recipes, and, of course, tattoos. Her boyfriend is a tattoo artist, and he's talented. When it finally came time to reconnect in person, we did it the awesome way that basically explains our friendship. Her boyfriend gave me my anchor tattoo, I accidentally left my Nikon at the shop, and my friendship with Katelyn was cemented. After that, we got together more often, and I started to sense that she was one of those people who will change your life. We look like we're practicing for our MySpace profile pic... in 2013. Katelyn is kind, but she is fierce. She gives so much more than she gets, and she exudes love and joy and peace and strength. Being around her makes you feel brave and bold. Katelyn pushes you towards the person you are supposed to be, and I don't think she even realizes she's doing it. She and I have had deep talks, cried over big losses, and I cannot imagine my life without her. Some girl in my math class who I was TERRIFIED of has become on of my closest friends. So, what does all this have to do with a blog post? Katelyn has a talent and a way to share all the incredible things that she is, and it's finally time to unveil it. All that energy, that focus, the peace and love and the hope for a happy future for everyone she meets? She puts all of that into beautiful pieces of jewelry, and it's incredible. Katelyn is the kind of person you spend your whole life wishing you could be. She's untouchable but real, perfected, but raw, and she is in touch with her emotions in a way that allows her to be her complete self around everyone who meets her. All of that insight and beauty and the strange and powerful allure of this girl come together in each and every piece she creates. She spends hours perfecting each wrap, charges the crystals, researches and explains the meaning and intention, and then gives away a little piece of her heart and soul with each purchase. There is something inside her that is inextricably connected to her jewelry, and once you buy a piece, you'll understand. A mutual friend of ours bought one of my favorite pieces a little over a week ago, and I thought I'd let her tell you how it went. In a world that has exploded with opportunities to "sell handmade", there are lots of venues, outlets, and sites to choose from. 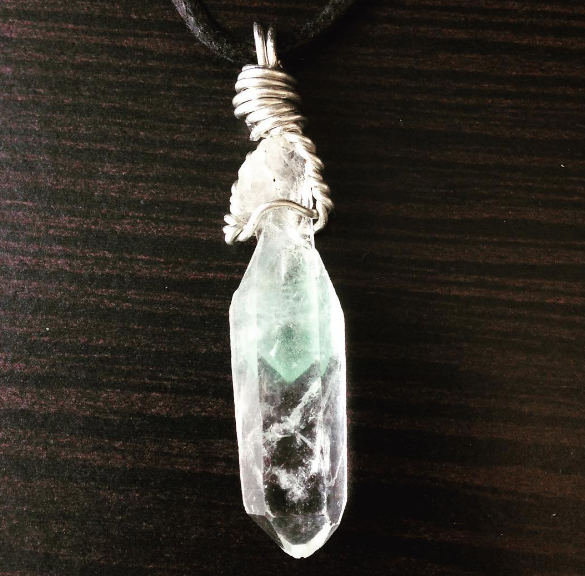 Pushed towards Etsy by everyone and tired of hearing "where can I buy a necklace? ", Katelyn came to me. She didn't want to make an Etsy shop. At first, I was confused, since that would be the most profitable and time-friendly choice... then I realized, this is Katelyn. Etsy would be wrong. 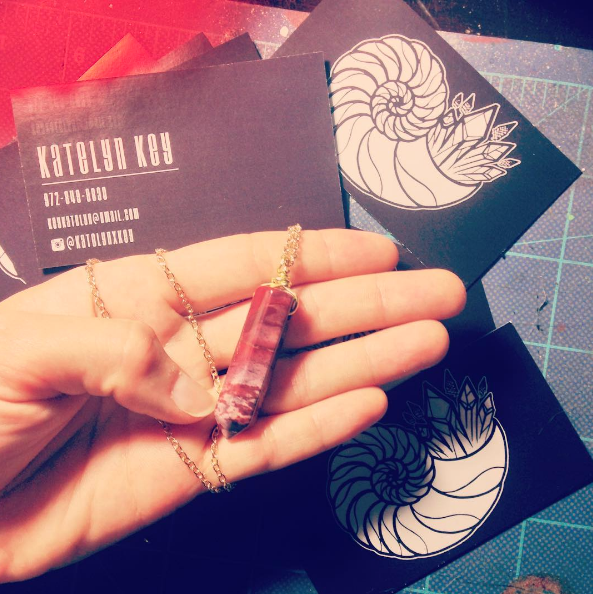 Katelyn makes each piece one at a time, individually, lovingly crafted specifically with someone or something in mind. She doesn't make ten identically necklaces and list them for sale, she makes one, just for you, and puts all of her time, love, and good intentions into it as she lets out her inner perfectionist and creates something beautiful and perfect specifically for you. When she's done, she moves on to the next creative endeavor; the packaging is perfectly Katelyn, too. She ships things out, she reaches out and asks if you've received it, and she genuinely wants to know how you feel about it. She's invested something in that piece, and she needs to know if its right for you. I could stare at this all day and never get sick of it. The best part of her work is the range of style she's able to create with a handful of different items. There's everyday, there's romantic, there's hippie (my favorite), there's gothic, and there's something you'll love, guaranteed. There are no words for this one. I can't explain it. It's who she is. It's what she does. It's cosmic and crazy and it's incredible. I took all of this, my love for this wild girl, her work and her intentions and her ideas, and I designed a website. It's been a crazy, running project that I wish I could devote more time to, because there is nothing I want more than to give her exactly what she needs to spread her love and talent to the world. We finalized the last few little touches today, and it's time for her to launch. We did a soft launch a few months ago with the first draft of the site, but the timing wasn't right. The Universe knows where and when things come together, and tonight, after over a year of planning, Katelyn's baby, PrettyXTwisted, is live. There is no way I can express how much I adore this girl, these pieces, and how much of my heart I put into this site. It is simple and open, and it looks almost like I didn't do much. The gallery holds photos of past pieces and gorgeous custom-made items, all of which you can use as inspiration for your piece. She'll talk to you, give you ideas, share rough drafts and plan out exactly what you want and need, and the entire process is simple and easy. When the mail comes and your jewelry is finally in your hands, you'll realize that something beautifully complex has come out of this "seemingly simple" site, and you'll be a friend of Katelyn's for life. She's one of those people you cannot let go of. You'll see what I mean. I present to you, www.prettyxtwisted.com. Find your bliss there, and have fun. This process and friendship have changed my life. It seems silly that a tattoo, an Algebra II class, and a necklace could bring such a huge tidal wave and drastically alter the course of my life, but that's just Katelyn. She's a hurricane. She's pretty and twisted, and that's why I love her. On designing a site outside your comfort zone.